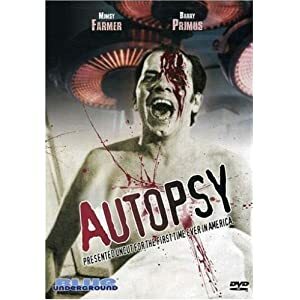 When one too many suicides come into the morgue, Simona Sana (Mimsy Farmer) takes note and wants to learn the truth – especially since an apartment neighbor who had plans to leave Italy for Pennsylvania, shot herself. Simona’s suspicions are confirmed when Father Paul Lenox (Barry Primus) states that her neighbor never would have done such a thing. And even though the priest is a bit off the rails, the pair works to uncover the truth. Once again, editing and sound are awful, which seems to be an Italian movie industry pastime. However, writer/director Armando Crispino’s story is certainly intriguing (he co-wrote the script with established scribe, Lucio Battistrada). Thanks to a wonderful sense of story, at one point the audience isn’t certain if Sana is losing her mind, if the priest is already a lunatic, if something demonic is afoot or if the rash of suicides is simply a coincidence. The story then, however, takes a pedestrian turn and the third act is simply weak instead of spellbinding, as if Crispino and Battistrada were uncertain how to wrap things up. Crispino, however, gave this movie far more of a chance than Argento would have. Instead of cranking out the tale for mass consumption, it was clear from the development of Sana he wanted the story to be a bit of a character study. But possibly due to the times and his own culture, Crispino kept his heroine on the sidelines when her involvement was needed most. Even with its shortcomings, the movie definitely maintains one’s interest, and it’s certainly worth a look from those who may only be familiar with more renowned Italian horrors. Thankfully, the great Blue Underground – the horror equivalent of The Criterion Collection – saved this one from the forgotten bin.